Native to northern Europe, black currants are a rich source of vitamin C and other heart-healthy antioxidants. 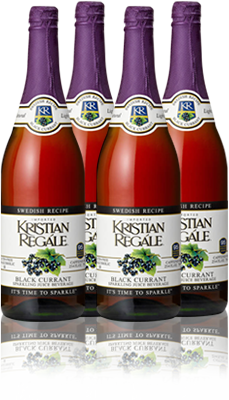 Kristian Regále Black Currant Sparkler combines real black currant juice with apple juice to make a delicious sparkling juice beverage. Purified sparkling water, apple and black currant concentrates, beet sugar, natural flavors, citric acid.